As the country’s leading supplier of Liquid Soy Base for the production of private label Soymilk and in a Beverage Industry focused on Protein, isn’t it time you Know the Facts……. Stop by our Booth at the Southern California IFT Supplier’s Night. Contact me to schedule a meeting at Natural Products Expo West in Anaheim. Rock City, IL, Thursday, September 01, 2016 — Devansoy is pleased to announce the addition of Kate Leavitt to our company’s leadership team. Ms. Leavitt has joined Devansoy as Vice President of Sales and Marketing and will build on Devansoy’s strong legacy of providing world-class service in the supply of premium quality organic and non-gmo soy and other plant-based products. Kate has over 20 years in the food and agricultural industry. Her experience includes roles in sourcing, sales and marketing – both domestic and international, supply chain management, processing, and logistics, serving in organizations including SunOpta, Northand Organic Foods and the Minnesota Trade Office. Fueled by a passion for providing healthy, alternative food products Kate thrives on delivering excellence– a natural fit for Devansoy. Her dedication to the natural and organic food industry, has provided Kate with the opportunity to serve on key industry boards including the Soyfoods Association of North America and the Minnesota AgriGrowth Council. Feel free to reach out to Kate or you are welcome, as always, to contact me directly. WASHINGTON – The Dietary Guidelines scientific advisory committee once again finds plant-based protein foods, such as soyfoods, offer meal options that are low in saturated fat, cholesterol free and nutrient packed. The just-released Scientific Report of the 2015 Dietary Guidelines Advisory Committee (DGAC) highlights dietary patterns that promote health, provide key nutrients and are sustainable. Specifically, the scientific advisory committee, assembled every five years and overseen by the U.S. Department of Health and Human Services and the U.S. Department of Agriculture, highlighted soyfoods in the Protein Foods group including foods and ingredients such as tofu, soy noodles, soy flours and soy protein isolates; fortified soymilk is part of the Dairy group; and edamame and whole soybeans are part of the vegetable legume subgroup. Soy protein-based foods and beverages also help lower blood cholesterol, curb one’s appetite and prevent some cancers, when started early in life. As for sustainability, soybean production uses substantially less water than animal production. Soybeans produce more than four times the amount of protein per acre as the next most efficient protein source, eggs; and soybeans are three times more energy efficient than corn and 10 times more than milk. The Committee suggested a wide variety of eating patterns could meet the overall goal of preventing disease and providing key nutrients, while still preserving cultural and religious dietary patterns. Soy-based foods and beverages provide the only complete plant protein that is equivalent to animal protein, and is so versatile that it is found in meals and snacks of numerous cultures. Soy is a large part of both the healthy Mediterranean-style and vegetarian eating patterns presented in the report, and is an ever-increasing component of the “healthy U.S.-style” pattern. Recent research shows that 42 percent of Americans consume soy-based foods or beverages once a month or more, compared to 30 percent in 2006. More and more Americans have incorporated veggie burgers, soymilk, tofu, soy yogurt, and other soy-based meat alternatives, cereals, beverages and nutrition bars, whether they are vegetarians, vegans, or just adding more plant-protein foods to their diets. The Scientific Report also defines healthy dietary patterns as having food combinations that limit sugar, sodium, and saturated fat. 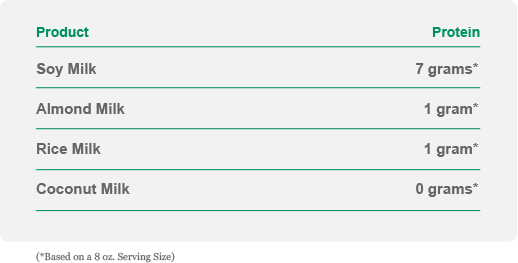 In particular, more polyunsaturated oils such as soybean or vegetable oil should be substituted for harder fats such as butter or lard to reduce saturated fat. Soyfoods are naturally lower in saturated fat and cholesterol than animal-based protein foods. For example, a half-cup serving of soy “crumbles” has no saturated fat compared with 80/20 ground beef containing 4 grams of saturated fat. Plant foods are also good sources of the “nutrients of concern,” identified as vitamin D, calcium, potassium and fiber, as well as iron for women. Fortified soymilk offers vitamin D, potassium, and calcium in quantities similar to dairy milk. Many types of tofu and cultured soymilk “yogurt” also provide calcium. A serving of edamame features 10 percent of your daily value of iron and 16 percent of dietary fiber. For more information on soyfoods and adopting a plant-based diet, please visit the Soyfoods Association website, soyfoods.org, or contact Andrea Albersheim at 202-659-3520 or press@soyfoods.org. The Soyfoods Association of North America is a non-profit trade association that has been promoting consumption of soy-based foods and beverage since 1978. The Soyfoods Association is committed to encouraging sustainability, integrity and growth in the soyfoods industry by promoting the benefits and consumption of soy-based foods and ingredients in diets. More information is available at www.soyfoods.org. Pagosa Springs, Colo. (November 6, 2014) – Devansoy, a leading soy protein ingredient manufacturer and noted soy food industry pioneer, today promoted its Chief Operating Officer Deb Wycoff to CEO. Wycoff succeeds Devansoy’s founder & CEO, Elmer Schettler, who assumes the role of chairman of the company’s board of directors. Deb Wycoff, entering her 25th year with Devansoy, has spent her career streamlining all aspects of the company’s operations including soy procurement, soy food production, technical application, health care, and logistics, as well as office and personnel management. As CEO, Wycoff will provide executive leadership, growth strategies, financial management, and strategic planning across all channels of the company. Wycoff, an established industry thought leader, was a member of SANA for several years where she held the SANA Board position of Treasurer. Deb is married to Howard Koster and has three children, Jennifer, Michael and Kenzie. Deb, who lives in Carroll, Iowa, is passionate about the outdoors where she enjoys biking and running. She is a loyal fan of the Iowa Hawkeyes. Founded in 1992, Devansoy is a soy protein ingredient company that has processed non-GMO, organic and hexane-Free ingredients for decades. Devansoy’s production of Soymilk takes place in a plant Near Rock City, IL where the majority of the 30 + employee’s work. The company offers liquid soy base, soymilk powders and soy flour, all of which are non-GMO and available in organic, conventional, full and low-fat. The company doesn’t sell direct to the consumer but its soy protein ingredients are used in a vast number of food and beverage categories. Engage Devansoy through its website at www.devansoy.com. 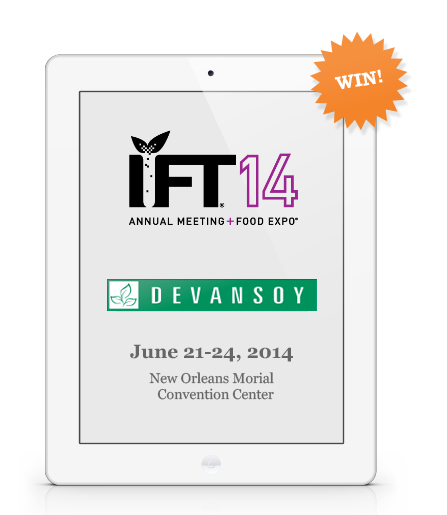 Join us at IFT 2014! Visit us @Booth #4118 this weekend! Visit us and register to win an iPad air! Devansoy sales jump more than 62% over last 5 years. As defined by Webster, one of his interpretations classifies progress as “to move forward: proceed.” During the past five years, Devansoy, Inc.’s sales have increased more than 62 percent, with an average growth rate of 12.5 percent. At Devansoy, a Carroll-based company since 1991, progress continues to grow and evolve as several different threads are woven together to produce this tapestry known throughout the industry as one of the top soy protein ingredient companies. “With Devansoy, that progress involves: people, customers, technology and sales,” said CEO Elmer Schettler. “The commonality with these four segments of Devansoy’s progress has been, is and will be ‘to move forward and proceed.’” The philosophy behind Devansoy’s progress is to seek people who have a strong work ethic, and are accountable for their respective duties and committed to the principle of providing superior products and service. This philosophy starts with Devansoy’s senior management team: CEO — Schettler; chief operating officer — DebWycoff; chief financial officer — John Ranson; and vice president of sales and marketing — Scott Desing. Although the principal office recently moved to Pagosa Springs, Colo., where Schettler, a former longtime Carroll County resident now resides, Devansoy continues to maintain a presence in Carroll, via the home base of the chief operations officer. Devansoy’s liquid soy production is based in Rock City, Ill., and the sales-and-marketing efforts are centralized in metro Atlanta. As a result of Devansoy’s progress the past five years, the personnel needs have paralleled that respective growth. Subsequently, the employment rate has expanded by over 38 percent since 2008, most recently with the addition of a highly experienced quality assurance manager. The most recent “move forward” is with a California-based company specializing in organic plant fertilizers for home use. Soy consumption, specifically soymilk and soy beverages, in the private-label category continue to increase year after year. The need for more non-dairy and lactosefree offerings, is and has been supported by rising consumer demand through all point-ofpurchase segments: mass market (retail/grocery), health food venues, club and box stores, foodservice, the military, etc. In today’s world, you’d be hardpressed to mention progress without noting technology in the same sentence. The semi-virtual nature of Devansoy’s structure has been optimized by the use of adapting to the ever-changing world of technology. And, as the technology needs of customers have evolved, Devansoy has kept pace with their respective needs. Recent technology updates at Devansoy ‘s Rock City production facility, include: hardware and software improvements, which have resulted in processing efficiencies. Utilization of Electronic Data Interchange (EDI), a standard for exchanging information between computer systems, is an example of technology that not only acts as an inter-face between the customer and the supplier, but also assists the interdepartment functionality within a respective company. The use of the Cloud via a remote server, and various business “apps” has proven to be quite beneficial with respect to: accounting software, the use and speed of electronic banking functions, streamlining financial operations, the elimination of repetitive tasks, etc. These days most are looking for ways to improve their overall health, whether it’s exercising more, eating less, or looking for healthier or more natural food choices. In Iowa, we are surrounded by fields and fields of soybeans, yet some of us have not tried very many soyfoods such as soymilk, tofu, or other foods containing soy ingredients. Scott Desing, vice president of sales and marketing of Devansoy, a supplier of soy ingredients, headquartered in Carroll, explains people may turn to soyfoods for various reasons. The reasons can be a “want” or a “need.” A “want” would be someone practicing veganism or looking to improve personal health. An example of a “need” would be lactose intolerance or an allergy to milk.